Google Translate doesn’t just translate words and phrases for you; it can also translate entire documents, such as plain text and rich-text documents, Microsoft Word documents, and HTML. It can even translate PDFs. The file-size limit for translating documents (as stated in Google’s FAQs) is 1MB. However, you may have success with larger documents. After all, it doesn’t hurt to try. Keep in mind, the larger the document, the longer the translation will take. Open a Web browser and go to translate.google.com. You don’t need a Google account to access it, because it’s free to all. Under the text box on the left, click the Translate a Document link. Click Browse to navigate to a document on your hard drive that you want to translate. Choose the language that the document is in — for example, English. On the right, choose the language you want the document translated into — for example, French. Figure 1: Translating a document. The translation appears in a blank browser window (see Figure 2). If you hover over each line, you can see the original English text that it was translated from. If you think the translation is incorrect, you can contribute your own. When you hover over a line of the translation, click the Contribute a Better Translation link. 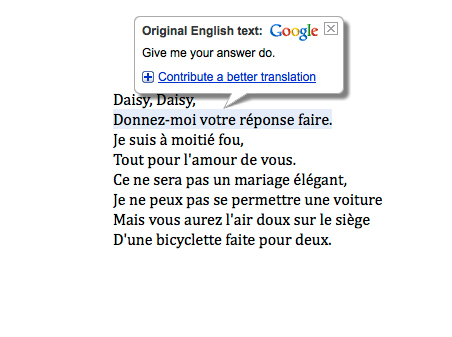 Type your translation into the text box and click Contribute. Your translation is submitted to Google Translate. To use the translated text, simply copy and paste it from the browser window into a new document. 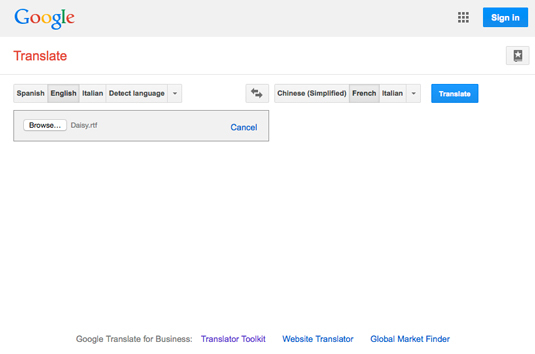 Just like other online translation tools, Google Translate is far from perfect. It does have a good reputation for accuracy, but it does make mistakes. So use it with caution. It may work fine in casual situations — for example, if you’re translating a love poem into another language for Valentine’s Day. But if you rely on it for translating official business documents, be very careful. It’s probably better to pay for a reputable translation when business is on the line. Figure 2: The translated document with a line highlighted.